Alex Bardua is June’s guest blogger! 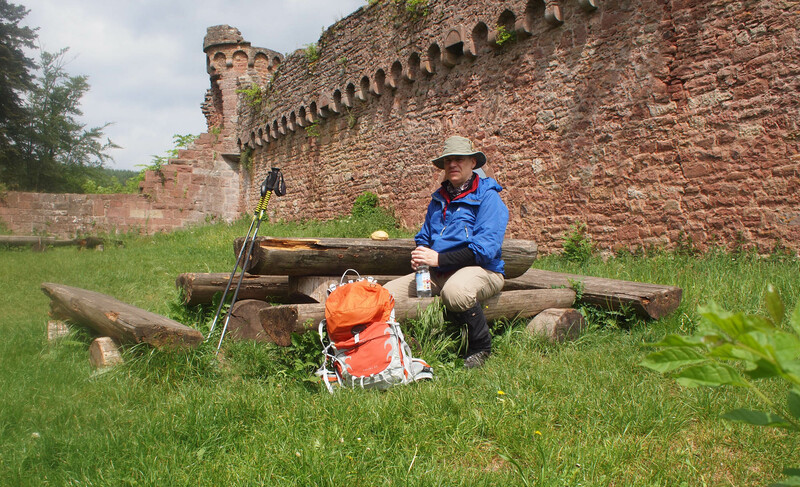 Founder of outdoor-professionell.de, gear-testing has become one of his passions and he likes to get to the nitty-gritty to make sure readers of his product tests get a hands-on result and not just machines doing the job! Those who do a lot of sports know this dilemma: base layers made from synthetic materials go very smelly very quickly. And in particular those old favourites that you’ve been wearing for years, they REALLY go smelly even quicker. Even the not so sensitive nose of male species tend to detect a specific smell… But, luckily, this never tends to be too much of a problem. It WILL become a problem though, when at home you hear, “Darling, don’t you want to throw away those old stinky base layers and buy yourself some new ones?” Sure, could do that, and there are tons of nice new fabrics out there, reducing body odours and wearing more comfortably, no question about that. But… to throw away some old travel companions that took you places over years and came along with you on many many trips? That cycling tricot, bought thirty years ago, I have done some ten thousand miles in it – and the colours have just become trendy again, too. Did a tour across Scotland in it, it still works. No holes, no broken seams. OK, it shrank a bit in the washing machine, feels a bit tight, but to throw it away? No way! I happened to visit the OutDoor trade show in Friedrichshafen, Germany at some point, and at the Nikwax stand they were handing out BaseFresh test products. There were a lot of promises about this conditioner for any type of base layers. What stayed in my mind, however, was this: “Fights Body Odours”. Add BaseFresh into the washing machine instead of fabric conditioner and your clothes don’t smell anymore? That would be something. So, if you do run a test on this, then it should have some proper results. This meant I needed to do a thorough test, results needed to be measurable – a direct comparison between the same pieces of clothing with and without BaseFresh. Plus, I needed a couple of highly sensitive noses for the sniff test. Female noses, of course – they are far more sensitive! Part 1: clothes, that was easy. Socks and tops from the past thirty years. Capilene, Coolmax, all types of synthetics. Tees, Sleeveless, Longsleeves. 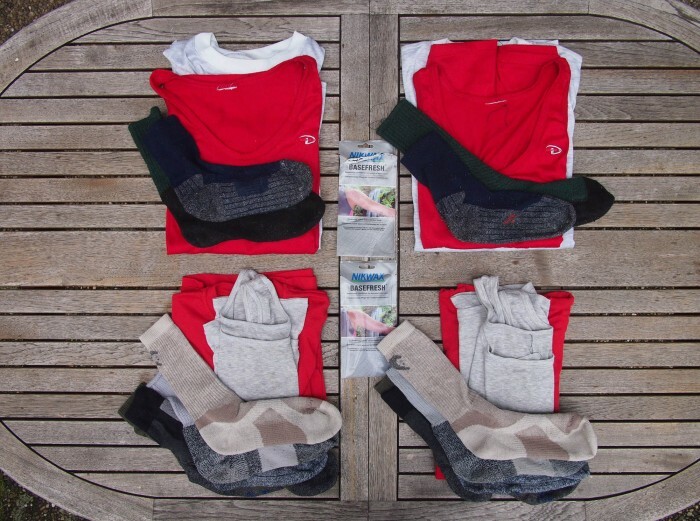 Plus, all kinds of socks, wool-synthetic-mixes and pure Coolmax. Highlight: a pair of 10 year old Ultimax Socks. Pure plastic, absolutely terrible, they were already smelly when new. Of each pair of test products I marked one of them with a piece of thread, then washed them all in two separate wash cycles. I used ordinary washing powder, as with BaseFresh you won’t need special cleaning products. I then added BaseFresh into the conditioning cycle of one of the wash programs. Part 2 was a bit more difficult: where would I get the female test persons? Finally, I found them within my inner circle of family members, they were kind of “forcibly recruited”. And they now had to try to find a difference via the sniff test. It was clearly defined: each pair of socks (one of each pair without the use of BaseFresh) were worn continuously throughout 8 hours in boots that I pulled very tight. Then I air-dried them and sealed them in plastic bags. 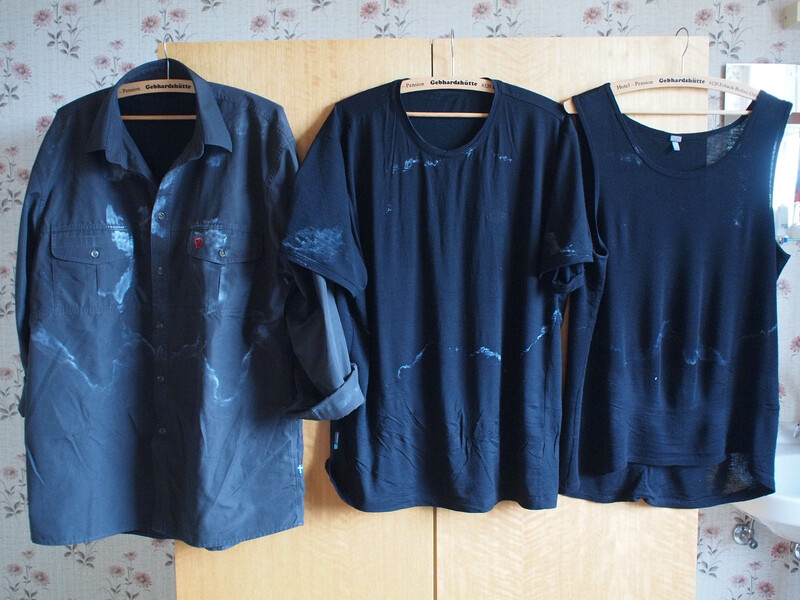 The two tops were taken on to a trip and worn one after the other. Then the same procedure as with the socks: air-dried and sealed in plastic bags. The results were surprising and obvious. Totally independent from each other, both of them sniffed the same results. The use of BaseFresh significantly reduced body odours. On some test products there was none at all, just the slight lemony scent that BaseFresh has. This was the case on the more modern pieces, as well as on the socks with high wool content. So, the good properties of the new fibres were further improved by the use of BaseFresh. On the other hand, unanimous voting for the Ultimax Socks: BaseFresh failed miserably. These socks simply stank – nothing would have helped here. To me, BaseFresh truly is an alternative to buying new base layers, as even older synthetics had a significant reduction of body odours. What’s more, clothing washed with BaseFresh feels great on your skin – that typical “plasticky feeling” is reduced by far. And BaseFresh is a good additive when washing base layers like Merino wool that already help to reduce the level of bodily odours. You no longer need to wash them separately as BaseFresh simply goes with any washing powder. Just stick it all together into the machine, add BaseFresh instead of a normal conditioner, done! With BaseFresh, you’ll definitely go easy on the noses of everyone in your vicinity, and you definitely promote domestic harmony too!